With so much to see and do in Canada, it is difficult to narrow down a list of potential attractions to visit. If you spend time in Eastern Canada, here are a few that you can add to your itinerary. This is a small city which used to be the capital of Canada. It is one of the most picturesque spots in the country and has a fascinating history. Visit Fort Henry and Bellevue House, the home of the first Canadian Prime Minister where you can step back in time thanks to guides in period costume. 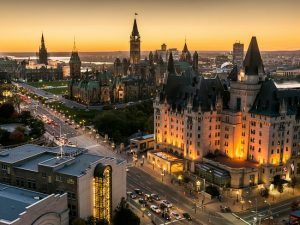 The current capital is a must thanks to the museums and galleries, and a night out in Ottawa is a great opportunity to try some of the local nightspots. The city has some beautiful historic buildings and most of the attractions are within easy reach of each other. If you are close to New Brunswick then you should visit the Bay of Fundy. The area is known for great seafood restaurants and pretty coastal towns and villages waiting to be explored. Many visitors go to Hopewell Rocks where the tides come and go rapidly. The Thousand Islands is actually a group of more than 1700 islands and the best way to see them is a boat tour. You can also take in Boldt Castle, which is actually in the US but very easy to get to. This is noted as the landing place of Leif Eriksson over 1000 years ago. Here you can experience life as it was then, trying traditional Viking food and listening to Norse legends. The largest city in the Quebec province is Montreal and it is a great opportunity to practice your language skills. The Gothic Basilica is not to be missed and there are plenty of places to pick up souvenirs. The country’s largest city, Toronto has so much to offer. The best way to see the city is to take the glass elevator to the top of the CN Tower to enjoy the views. The Gros Morne National Park can be found in Newfoundland. Cliffs and waterfalls have created a dramatic landscape here and you can make the most of it with a boat tour. Quebec City has a lively and picturesque old town area and plenty of reminders of the city’s French heritage. Enjoy the city’s charms with a ride in a horse-drawn carriage or visit in winter to stay in the Ice Hotel. One of the top tourist destinations in Canada is Niagara Falls, where the waterfalls are not the only attraction. Enjoy great restaurants, hotels, casinos, museums and other attractions in one of the world’s most romantic sites.